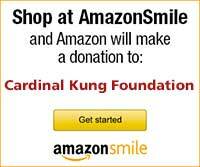 Stamford, Connecticut, U.S.A. - His Eminence, Ignatius Cardinal KUNG Pinmei died at 3:05 AM on March 12, 2000. He was 98 years of age. 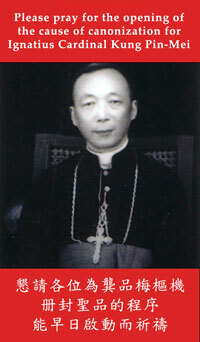 Cardinal Kung was the Roman Catholic Bishop of Shanghai, and the Apostolic Administrator of Souchou and Nanking since 1950, a post he held until his death. He was ordained a priest almost 70 years ago on May 28, 1930, consecrated a Bishop 50 years ago - the first native Chinese Bishop of Shanghai - on the Feast of Our Lady of the Rosary October 7, 1949 after the communists had already taken over China. Cardinal Kung was created a Cardinal by Pope John Paul II in pectore (in the heart of the Pope, without announcement to anyone in the world including Cardinal Kung) 20 years ago in 1979 at the age of 78 when the Cardinal was serving a life sentence in isolation in China. Living in the heart of Pope John Paul II for 12 years, Cardinal Kung was finally proclaimed a cardinal to the world on June 28, 1991 by Pope John Paul II. At the time of Cardinal's death, Cardinal Kung was the oldest Cardinal. Knowing that he and his priests would soon be arrested, Bishop Kung trained hundreds of catechists to pass on the Roman Catholic faith in the diocese to future generations. The heroic efforts of these catechists, their martyrdom and that of many faithful and clergy contributed to the vibrant underground Roman Catholic Church in China today. Bishop Kung's place in the hearts of his parishioners was very well summed up by the Shanghai youth group in 1953 new year youth rally when they said: "Bishop Kung, in darkness, you light up our path. You guide us on our treacherous journey. You sustain our faith and the traditions of the Church. You are the foundation rock of our Church in Shanghai." 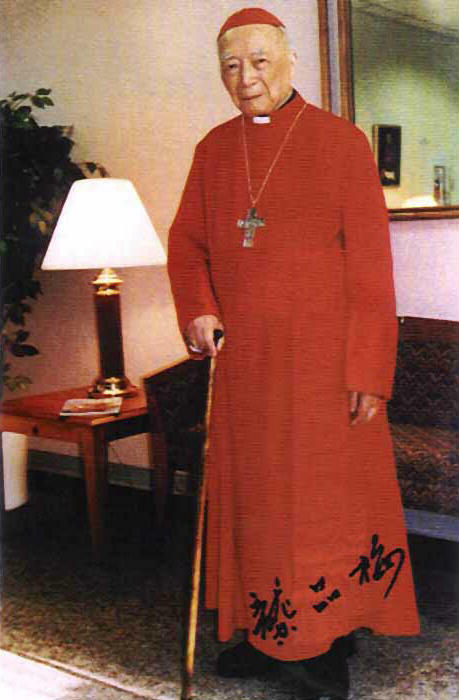 The late Bishop Walter Curtis, the Romon Catholic Bishop of Bridgeport, Connecticut at that time, invited Bishop Kung to stay with the retired clergy of the Bridgeport Diocese upon his arrival in the United States. He remained a guest of the Diocese - later headed by Bishop Edward Egan - for 9 years until December 1997.